Published as part of a debate on helmet laws in Injuy Prevention 1998 Sep;4(3):170-2; also in the Australian Doctor, 27 February, 1998. This article shows that bicycle helmet laws have done more harm than good. They have not produced any noticeable reduction in head injury rates. But, by discouraging cycling, have deprived many of healthy exercise and pollution-free transport, adding to the billions our sedentary lifestyle already costs. Effective road safety initiatives are great news. 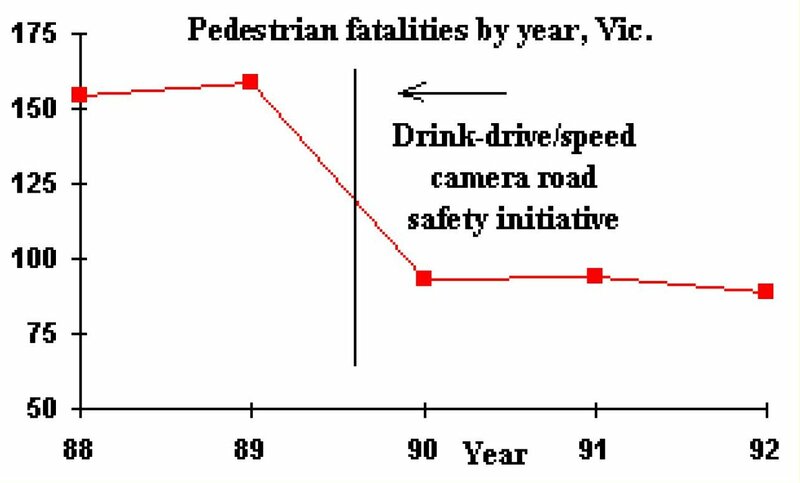 The speed camera/anti-drink-driving campaign, introduced in Victoria about the same time as the bike helmet law saved the community AUD 200 million in 1990 for just AUD 5.5 million. Graph 1 (left) shows the size of the drop in pedestrian fatalities. However, ineffective road safety measures may cost money, without offering much benefit. Graph 2 shows the percentage of cyclist hospital admissions involving head injury in Western Australia (WA), together with the same data for pedestrians, car drivers and occupants. Percentages have changed over time, but cyclists seem no different from other road users. There is no sudden change in response to a law which increased helmet wearing from less than 39% to more than 80% of cyclists. Unlike the effect of the drink- driving/speed camera campaign, benefits of bicycle helmets seem too small to show up. Yet the cost of the WA helmet laws, pre- law promotion and purchase of helmets was $18 million, 3.3 times more than the highly successful Victorian road safety campaign. How much more might we have gained had the money been spent on more effective measures? A similar lack of effectiveness has been found elsewhere. In New Zealand, no detectable effect of increased voluntary helmet wearing was found on percentages of cyclists with head injuries. In Victoria, with 3 years post-law data, percentages of cyclists with head injury after car-bike collisions were found to be no different from predicted pre-law trends. Indeed, excluding a small number of unknowns, 76% of fatally injured cyclists in Victoria in 1991-92 and 80% of fatally injured cyclists in NSW in 1992-94 were wearing a helmet at the time of the crash. Helmet wearing in cyclist fatalities was therefore no different from the 75% of Victorian and 80% of NSW cyclists observed wearing helmets in official surveys. A puzzle is why some case-control studies have apparently found benefits of helmets, but no effect of laws has been observed in hospital records, at least when properly adjusted for numbers of cyclists and trends common to all road users (eg Graph 2). A problem is that case-control studies must adjust both for trends and differences in attitudes and riding styles of those choosing to feel safe and wear helmets compared to those deciding otherwise. If adjusted incorrectly, differences in injuries caused by differences in riding behaviour of helmeted and unhelmeted cyclists might be attributed to helmets. Cyclists forced to wear helmets may also feel more protected and so take more risks. Such effects are difficult to estimate. So it is better to judge the benefits of helmet laws by their effect on head injury statistics. And consider them failures if no effect is apparent. In contrast to effects on head injuries, the effect of unpopular helmet laws on cycling activity is readily seen. In Melbourne, surveys were conducted pre-law in May 1990 and post-law in May 1991, at the same 64 sites and same observation times. Counts of child and adult cyclists declined by 42% and 29% respectively. In total, 297 more helmeted cyclists were counted than pre-law, compared with 1100 fewer cyclists. It’s as if the law didn’t so much encourage helmet wearing as discourage cycling! The same happened in NSW, the only other state to conduct reliable pre- and post-law counts, but only of children. Across-the-board reductions were found, in metropolitan, inner rural and outer rural areas, at road intersections, in recreational areas and at school gates. Altogether, 2215 (36%) fewer cyclists were counted, compared to an increase of only 1019 cyclists wearing helmets. Claims that numbers of cyclists have now "recovered" are misleading. Cycling was increasing before the law, so we need to compare current levels with the increase that might have been expected without the law, or estimate discouragement by other means. A survey of 1210 secondary schoolchildren questioned in Blacktown, Sydney, found helmet restriction was the most common reason (33.8%) for not having ridden last week. Other reasons were not owning a bike (33.4%) and safety fears (11.8%). A telephone survey of adults in WA found a figure equivalent to 64% of current adult cyclists would ride more if not legally required to wear a helmet. Reductions in cycling mean reductions in healthy exercise and discouragement of non polluting transport. Life years gained due to the healthy exercise from cycling, even without a helmet, have been estimated in the UK to outweigh those lost by 20:1 The risk from being sedentary is similar in magnitude to smoking 20 a day. If another 40% of Australians undertook regular, moderate and effective exercise, the community would save AUD 2.4 billion/year in reduced costs associated with heart disease, low back pain, absenteeism and workplace productivity. Other unintended social consequences of helmet laws include a 12 year old aboriginal, owing $2,000 in helmet-law fines, threatened with 40 days jail, and the jailing of a pregnant woman and a girl aged 15 (for 2 days) for failure to pay fines. In summary, cycle helmet laws have not produced any noticeable reduction in head injury rates. But, by discouraging cycling, they deprived many of healthy exercise and pollution-free transport, adding to the billions our sedentary lifestyle already costs. Helmet laws have therefore done more harm than good.